The Quest 9 in 1 Steam Cleaner, model number 43560 is lightweight, slim and easy to store compared to other popular gadgets in this industry. Particularly nice is the adjustable temperature control that can be set according to the needs of the job. It comes in the color yellow and weighs 2.9kg .It is powered by 1300 watts motor with 5m long power cord. The dimensions of this product are 27 x 15 x 54cm and has a good capacity of 450 milliliters. Voltage is AC220 240/50Hz. Has an indicator light that changes color when the steamer has reached optimum temperature. It is very useful on a variety of floorings such as tile, laminate, wood, and vinyl. Another great use of this steam cleaner mop is that it freshens up carpets and rugs that tend to hold in odors. It also does well at washing windows. It comes with a 6-month warranty and the customer service is excellent. Replacement parts are also easily obtained. Compared to more expensive steam cleaners ; the Quest steamer does a comparable job and costs less. The Quest 9 in 1 steam cleaner is manufactured by The Benross Group, makers of quality household and gardening products. This steam cleaner can be used as a floor steam mop or converted to a handheld cleaner. The floor head is large which increases its surface area for better cleaning efficiency and getting to hard to reach places. A full tank runs for approximately 20 minutes. It comes with a jug that makes filling very easy. Instructions manual is also included in the pack. It is sure to fit all budgets as well as perform at a top quality level. 2 carpet glider cloth pads, a duster, jet nozzle, telescoping hose, and an upholstery cloth. My overall verdict on this Quest steam cleaner is that it is a great buy for the money and the quality of the product. It has an overall rating of 3.4 stars out of 5, or 68% overall satisfaction rating. The fact that it heats up in 30 seconds is a huge plus and makes life a bit easier. It is a worthwhile investment if you are looking for steam cleaners. It sanitizes floors and surfaces very effectively. It is also very versatile. This steamer can clean floors and convert to a handheld steamer. It cleans, deodorizes, and sanitizes not only floors, but upholstery, bathroom surfaces, car wheel trims, ovens, tiles, carpets, rugs, and garments using the handheld device. It is awesome in the bathroom for cleaning and sanitizing surfaces that get dirty quickly and is effective at cleaning up black mold around the seals in the tub and sink areas. Another great benefit is that it has plenty of power, offering 1300w of cleaning and sanitizing power to get any job done. There are no worries about it not being useful for tough jobs. If you don’t like using harsh chemicals, you are in luck, as this steam cleaner uses no detergents.It is excellent in getting up dirt that scrubbers and bleach fail to get. It effectively cleans up sticky grime and scuff marks. 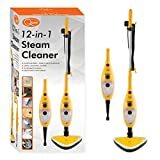 When looking at more expensive steamers with the same accessories and versatility, I would pay the lower price and buy the Quest 9 in 1 steam cleaner. It gets the job done for less.